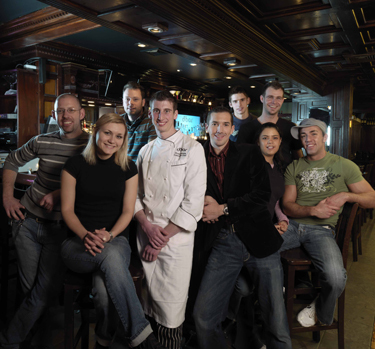 dbar has established itself as Dorchester's premier dining and cocktailing destination, representing the gentrifying Savin Hill neighborhood with its many regulars and clientele from surrounding areas. Formerly an old-school Irish pub filled with mahogany charm, dbar has been renovated into a hip chic hot spot. With glowing candles and long leather banquettes, it remains casual and comfortable. The interesting and classy menu by Executive Chef Christopher Coombs changes with the season's finest and freshest available ingredients and courts the foodies throughout the Boston area. Most of the menu takes a French twist, but it also contains comfort foods such as Chris' famous Veal & Pancetta Bolognese. dbar's exquisite yet affordable $19 and under entrees along with its own parking lot make for an affordable alternative to expensive downtown dining. From espresso martinis to a fine glass of Bordeaux, dbar caters to all with an eclectic martini list and a 200 bottle wine selection that will far exceed your expectations. Come and surrender to your innermost desires at dbar!